U.S. crude oil and lease condensate proved reserves increased by 9% to 39.9 billion barrels, and natural gas proved reserves increased by 10% to 389 trillion cubic feet in 2014, according to EIA’s U.S. Crude Oil and Natural Gas Proved Reserves report. Source: U.S. Energy Information Administration, U.S. Crude Oil and Natural Gas Proved Reserves. U.S. crude oil and lease condensate proved reserves reached the highest level since 1972, and natural gas proved reserves surpassed last year’s record level. Proved reserves are volumes of oil and natural gas that geologic and engineering data demonstrate with reasonable certainty to be recoverable under existing economic and operating conditions. Because they depend on economic factors, proved reserves shrink or grow as commodity prices and extraction costs change. EIA’s estimates of proved reserves are based on an annual survey of domestic oil and natural gas well operators. Texas had the largest increase in proved reserves of crude oil and lease condensate, representing 60% of the nation’s total net increase in 2014. This increase was driven by development of tight oil plays (e.g., Wolfcamp, Bone Spring) in the Permian Basin and the Eagle Ford Shale play. North Dakota had the second-largest increase, 362 million barrels, which came mostly from the Bakken tight oil play in the Williston Basin. Proved natural gas reserves were added onshore in the Lower 48 states in several of the nation’s shale formations, particularly the Marcellus Shale play in Pennsylvania and West Virginia, the Eagle Ford Shale play in Texas, the Woodford Shale play in Oklahoma, and the Utica Shale play in Ohio. 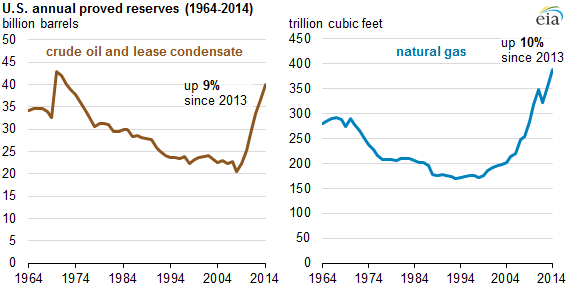 Natural gas in shale plays now represents slightly more than half the U.S. total natural gas proved reserves. Sustained lower prices for crude oil and natural gas in 2015 are anticipated to reduce oil and natural gas proved reserves in EIA’s next annual report (for year-end 2015). Lower prices have curtailed oil and natural gas drilling and have made recovery economics more challenging. Although resource estimates are not necessarily reduced by lower prices, the calculation of proved reserves is sensitive to price.